If there is one thing we got asked for a lot in the store, it was maps. Trouble is, while there were some good map posters out there, they were either very expensive, or were not laminated for durability – which made them little better than unfolded paper maps you buy at the gas station. But we finally got a map supplier who we were happy with- and the result are some well detailed, large sized and laminated maps! 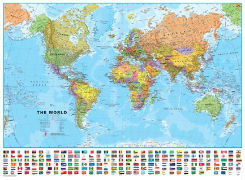 Well detailed and large sized (51-1/2″ x 37-1/2″) this poster map also has a near complete list of the nations’ flags at the bottom. This map is excellent for home or school! Slightly smaller than the World Map (45-1/4″ x 37-1/2″) this map has pictures of every state in the Union, as well as inserts for Alaska and Hawaii. 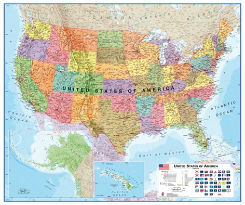 The USA map is also laminated and a great addition for home, office or school! Both maps are $19.95 each and in stock. Make Do – A toy of creative building! The Make Do kits come in different forms, the main one is the simple MakeDo Kit for one. 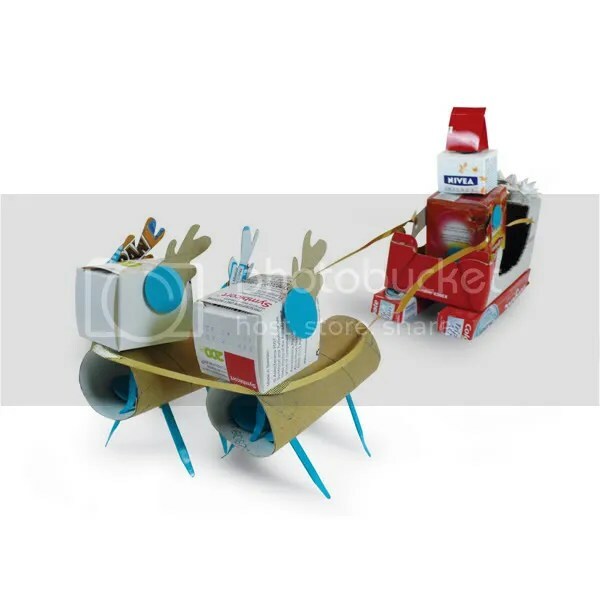 Other kits in the Make Do series are more purpose driven, such as the Make Do Find and Make a Car Kit. 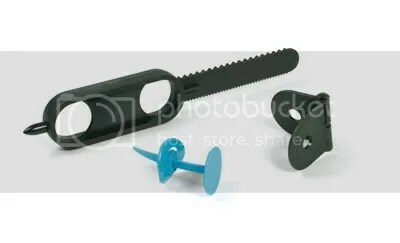 Here your kit is designed around making boxes into play cars! 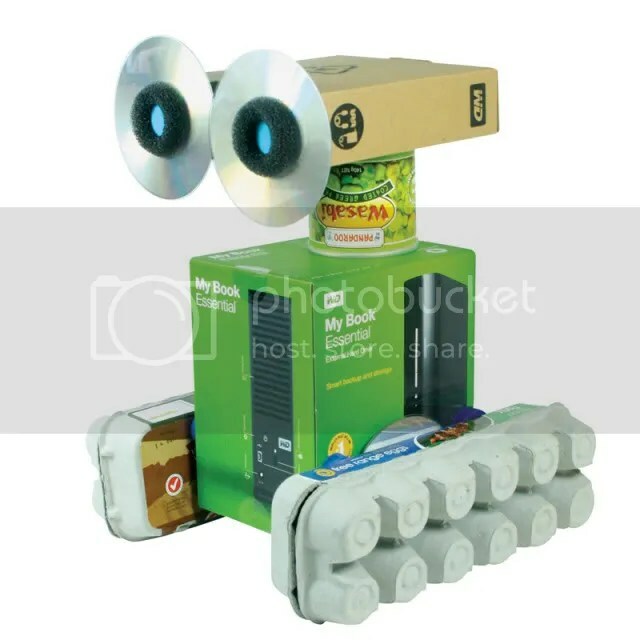 Also fun is the Make Do Find And Build a Robot . Much like the find and build a car kit except this one is oriented towards building robots! 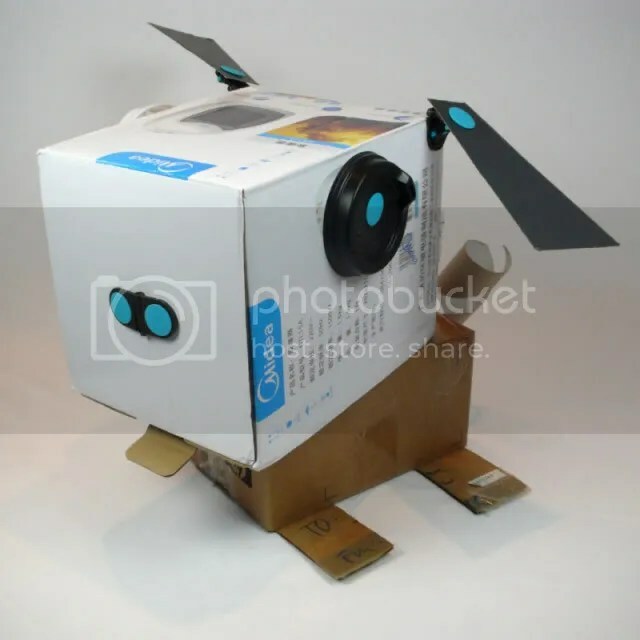 Make Do kits are incredibly versatile and really let a kids imagination grow! 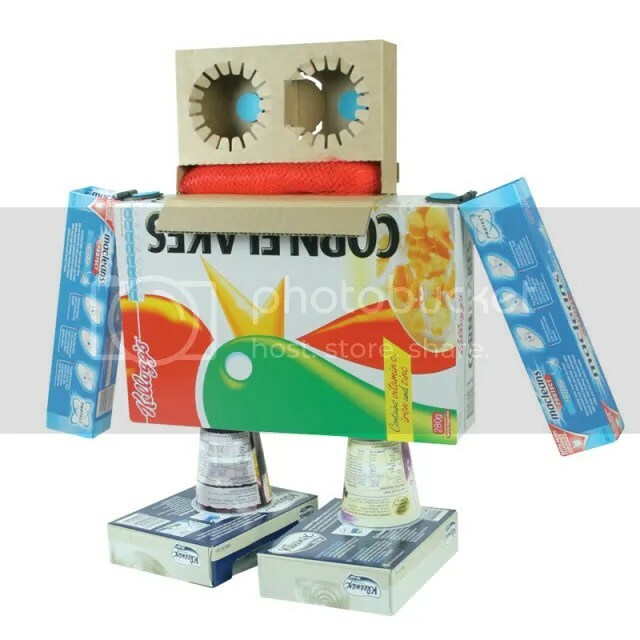 They bring out the best in construction and let you re-use those empty boxes! 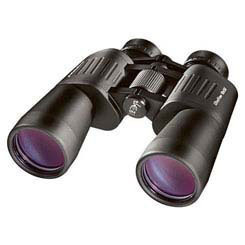 Take a look at the front of any pair of binoculars, refractor telescope, or even most sets of eyeglasses and you might notice that they often have a blue, green, or even purplish tint to them. This is a sign of an Optical Coating. Optical coatings have vastly improved the quality of optics over the past decades. The reason for their existence is simple: Every time light goes from air to glass it loses as much as 8% of the light due to scattering/reflection. This may not sound like much but when you consider that a basic refractor telescope with an air spaced achromat (lens with two or more elements) and a decent two element eyepiece will have 4 air-to-glass transmissions. So thats ((((100%*.92)*.92)*.92)*.92) = 71.6%. You lose over 1/4 of the telescope’s light gathering power from scattering! That doesn’t include a mirror or prism diagonal which will also lose light! Binoculars have a similar problem, only more so as they have internal prisms that add even more air-to-glass transmissions. (Eyeglasses do not need coatings so much, but they do not cost too much and usually don’t hurt to add). Hence optical coatings were developed. Coatings do not solve the light scattering problem, but they sure as heck reduce it. A decent coating can reduce the light scattering from 8% loss to around 4-6%. Adding even more layers, or multi-coatings improves the scattering reduction, as does the quality of the coating application. But nothing completely ends scattering. Optical coatings in lenses are almost always made of Magnesium Flouride (MgFL). They are applied in a vacuum chamber. A single optical coating should have a very subtle blue color when you look at the lens surface at an angle. Multi-Coats will have a green or even purple tint when you examine the surface. Coated means that at least one air-to-glass surface in the optical system has an optical coating. Fully Coated means that all air-to-glass surfaces in the optical system have an optical coating. Multi-Coated means that at least one air-to-glass surface in the system has an optical multi-coat. The rest should have at least a single optical coating. Fully Multi-Coated means that all air-to-glass surfaces in the system have mutli-coatings. There are some variations on this. In Europe optical multi-coats are often referred to as ‘Overcoated’. Adding further to the confusion is that some companies give names to their coatings. Sometimes this is warranted as the coating is somewhat different from standard coatings, more often it is just marketing. There is a dark side to coatings, the worst of which is the abuse of ‘Ruby Coatings’ on binoculars. Ruby coatings first came out from Steiner Binoculars who are fond of making specialty binocular coatings for specific environments, such as hunting binoculars whose coatings that bring out objects better in foliage, desert coatings for the same purpose in the sandy zones, etc. One coating developed by Steiner had a ruby color. It worked acceptably, but it worked by partially blocking some of the wavelengths of light. The Steiner version did this only a little, but the resulting coating had a problem: It looked cool. Since the Ruby coatings looked cool, Hollywood and Madison Avenue started using binoculars in ads and movies with the ruby coatings. This turned out to be a bad thing as many low-end binocular producers started churning out ruby-coated binoculars by the container-load. But there was a problem: Ruby Coatings didn’t give you a very good image. If you look through a Ruby coated binocular and compare it with a normally coated binocular you will see that it looks a little washed out. The greens and blues stand out too much, the reds are faded. Its like looking at a photo that has had some sun bleaching. This is because the red portion of the spectrum is being deflected by the Ruby coatings, which low-end binocular producers made with brighter and brighter red coatings that dropped more and more red light. Eventually, it got to the point where you could not have a low-cost binocular without a Ruby coating. But soon the Ruby started to lose its value. 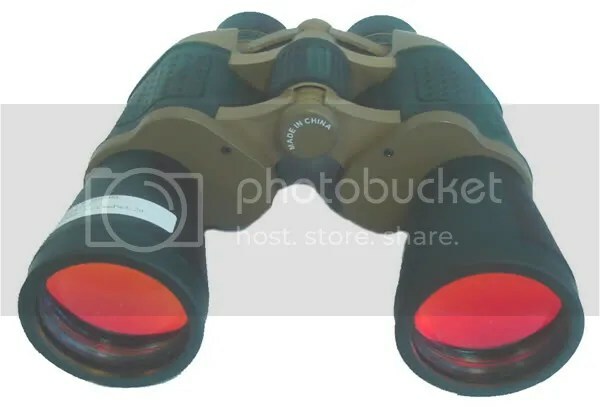 Bird watchers knew that the drop of the red colors meant they could not see all the details in their favorite birds, folks wondered why so few higher end binoculars didn’t use ruby coatings if they were so good, some binocular sellers outright spoke out against ruby coatings. Soon many of the ruby coated binoculars started to show up with regular coatings. You can still find ruby coated binoculars, but they are usually sold at the lowest end, sometimes even with bad TV ads. These are usually sold on the basis of their ‘cool’ appearance to those who do not know better. If you encounter a pair of ruby coated binoculars, try to avoid them. They are not worth even their low end pricing. We had a bit of success with some of our previous brass items, such as the small brass sextant and the small brass equatorial sundial that we decided to add a few new brass items to our product line. They look great and are functional! This telescope has a fixed 20X magnification and a tripod that extends from 35″ to 62″ tall! It looks great in any room and adds a touch of class! It is also a bargain at only $229.95! The next items are nowhere near as large, but they can still be very impressive. First up is the 3″ Brass Sundial and compass. This sundial/compass has lots of neat features and looks great. It also comes with a wood storage box with brass features! A slightly smaller version of the Brass Compass/Sundial combo is also available: The 2-1/4″ Brass compass/sundial . This unit does not come with a wood box, but does have a brass lid with a brass ‘calculator’ for determining actual time. The whole unit fits neatly in your pocket! Next up is the 4″ Brass Directional Compass. Built on a solid wood base, this compass really can impress with its large size and gorgeously carved brass interior. Finally there is the liquid-filled 2-1/4″ Brass Compass. Almost downright utilitarian by comparison to the other brass items, this compass still looks great! The interior markings are a nice contrasting black and white surface and the liquid filled compass ensures no excess ‘wobbles’ when moved! These brass items make great gifts and yet are quite functional as well! Dmitri’s neighborhood is a book on the basics of chemistry written in a low-stress way to learn chemistry concepts. Written by Marti Trudeau, an author local to Spectrum Scientific’s store. Working with the concept of the periodic table (developed by Dmitri Mendeleyev – hence ‘Dmitri’s neighborhood) the book walks easily and amusingly through the basic elements and covers topics such as chemical formulas, atoms, electrons, and much more. Concepts are covered in an easy to equate style so that students can learn easily – the world of chemistry is presented in a manner as if you were walking around a neighborhood and meeting the neighbors (elements). Over 150 pages along with appendices covering the details about the elements. This is book is a great way for junior or senior high school students to learn about chemistry. The New Benchmark Orbi-Shaker C02! Benchmark Scientific has done it once again! They’ve already neatly filled the orbital lab shaker market with a great series of products like the Orbi-Shaker, the Incu-Shaker and the low-speed Orbi-Blotter among others. 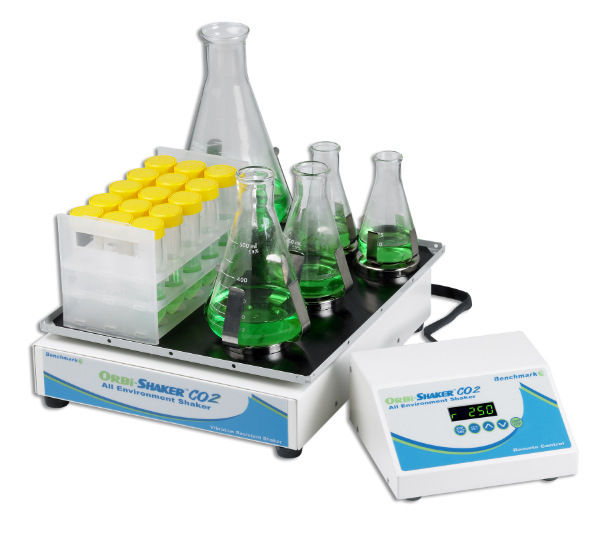 But now they have also added the Orbi-Shaker CO2. The Star-Naming Scam – It’s Back. This holiday season was the first in some time that I have not heard radio ads for the ‘gift’ of ‘naming a start after them’. Well, maybe I just wasn’t listening to the radio enough because I did hear one, and its just as bad as it ever was. OK, let’s just go over the facts right now: Stars are not named after people, stars are ‘named’ by all sorts of designations. The brightest have kept their arabic names., but the fainter ones are named via designation, which usually means they are numbered. You can’t just walk into the International Astronomy Union and throw down a few bucks and get a start named after you! They don’t do that, and consider it crass enough to put up a page over the matter. So what do these Star Naming groups do? Well they actually proudly tell you how little they do: They put the name in a book. That’s it. That’s all. Give us $20 and we’d happily put your name in a book as well. But what is their cincher? Well in the ad I heard they register the book with the US copyright office. Wow. The way the guys says it implies that means something to him, but as for astronomy it means nothing. I can produce a Star Atlas with every star name changed, and I can even register it with the US copyright office – but all that means is that no one can copy my book and make money off my new name Star Atlas. It doesn’t mean anyone with a telescope is going to start calling Rigel ‘Fred’. Even if it meant anything in the US, the rest of the world would hardly care a bit. For the record, in older radio ads, the book was said to be registered with the US Patent office, I suspect the patent office took offense to being referred to in this manner. The rest of these star naming nonsense adds on a few extras to make it seem like a bargain. In reality you are just getting a cheap astronomy kit at very inflated prices. The typical items are: a Certification Sheet (easy to print), an astronomy program (there are many freeware programs that are probably superior) and sometimes a book. The quality of the book is unknown, but I cannot imagine it is one of the better books on the market. So if you really want to do something like this, consider ‘adopting’ a star. Many non-profit groups have star adoption programs to raise funds. You don’t get the cheap software, but you do get a more accurate Certificate (although you have to print it). Our personal favorite is the Pale Blue Dot which helps the Kepler planet spotting project continue. Here you are looking at candidates for adoption that are not only stars, but that might have planets orbiting them! Don’t fall for the ‘naming’ scams. Let this nonsense end.